Cholinesterase Inhibitors: Prevents breakdown and increases the amount of neurotransmitter acetylcholine available to brain cells. Acetylcholine is a brain chemical needed for memory, thinking, and reasoning. Cholinesterase inhibitors can’t reverse Alzheimer’s disease or stop nerve destruction. Cholinesterase inhibitors aim to prevent breakdown of acetylcholine and improve symptoms. Aricept (donepezil)- The only drug approved to treat mild, moderate, and severe Alzheimer’s disease. Aricept is often tolerated well with minimal side effects. As noted in WebMD, Aricept is the only drug approved by the FDA to manage all stages of Alzheimer’s disease. Common side effects include: N/V/D, insomnia, loss of appetite, fatigue, muscle cramps, and weight loss. Gradually increasing doses and taking medications with food can help decrease intensity of side effects. For more information visit drugs.com. Exelon (rivastigmine)- Used for mild to moderate Alzheimer’s disease. Exelon is taken twice daily with food, and it’s available in pill, oral solution (liquid), and transdermal patch. Common side effects include: N/V/D, upset stomach, loss of appetite, weight loss, and weakness. Razadyne or Reminyl (galantamine)-improves nerve-cell function in the brain by preventing the breakdown of the neurotransmitter acetylcholine. Reminyl is used for mild to moderate dementia caused by Alzheimer’s disease, and is taken once or twice daily with meals. Common side effects include: Feeling tired, dizziness, nausea, vomiting, gas, loss of appetite, weight loss, and headache. Namenda: Used to treat moderate to severe Alzheimer’s disease. As defined by WebMD, “This medication works by blocking the action of a certain natural substance in the brain (glutamate) that is believed to be linked to symptoms of Alzheimer's disease.” Namenda is available in pill form or liquid form. Common side effects include: Diarrhea, Dizziness, and headaches. Your physician may recommend other therapies in addition to commonly prescribed Alzheimer’s medications. It’s important to consult your doctor and nurse before using any Over-the-Counter (OTC) products. Vitamin E, Coenzyme Q10, Coral Calcium, Gingko Biloba, and Huperzine A. 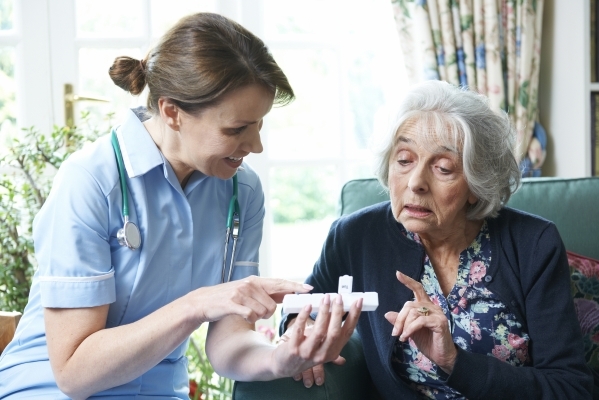 Your physician may recommend other therapies in addition to prescribed Alzheimer’s medications. It’s important to consult your doctor and nurse before using any Over-the-Counter (OTC) products natural remedies. Medication adherence is key for optimal wellbeing. Also, be sure to report abnormal signs or symptoms promptly to your physician to prevent any health complications.